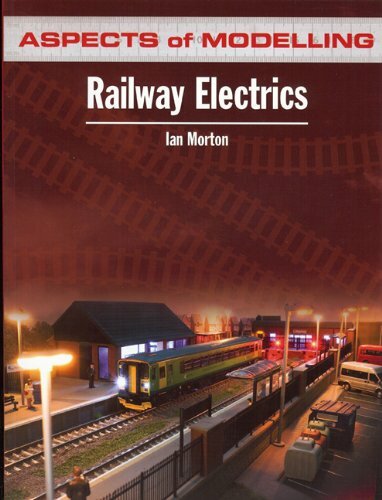 The aspects of modelling book on railway electrics by Ian Morton is designed for those that shy away from this difficult subject that can make grown men gibber and start shaking at the knees, but once said men get their heads around the basics they then wonder what all the fuss is about. The meat of the book deals with things like wiring up point motors (both the ‘usual’ twin-solenoid Peco-style motors as well as the more exotic ‘Tortoise’ slow-action motors), multi-aspect signals, control panels and the like although there are also introductory sections on choice of wire and a beginner’s guide to soldering – if you already have the know-how, these can be skipped. There’s also a guide to LEDs and lighting, and a useful section on pointwork which covers the relative merits of dead-frog and live-frog points whilst conveying useful information on the additional wiring which may be required for the latter in certain situations – wiring live-frog pointwork is potentially a book in its own right, but is treated in a bit more depth than you’d find on a Peco instruction sheet. It should be noted that DCC (digital command control) is not covered, largely because any such information would be redundant but also because including such information would be straying beyond the focus of the book. Quite apart from anything else, there are plenty of books on DCC for those who wish to look for them and Ian Morton’s own book on DCC covers most things you would want to know on the subject. Railway Electrics strikes a nice balance between explanation and illustration – there are plenty of photographs and diagrams, all of which are easy to follow. Ian Morton is to be congratulated for explaining a potentially complicated subject in an easy to follow manner.